Why is a Swedish bird tour operator selling binoculars in Peru? I never thought I was going to sell binoculars, and indeed it is not and will never be my main principal activity. We are after all a birdwatching tour company and our business is guiding birders in Peru and elsewhere in South America. So how did I end up pushing binocs in Peru? Birding in Peru may have a reputation of not being very safe and I will always dispute this, showing examples of people who have lived in Lima and moved back to the States to find they all of a sudden get burglars or cars broken into. It can happen anywhere. Armed robbery is more traumatic, however…and you can be certain that to anyone it happens, that the same person will be telling the world that such and such place is very dangerous, even if it is a very rare event. During our 10 years as a company in Peru it has only happened twice that hand-bags or luggage has been stolen from our clients. Of more concern are armed robberies. Not only is it a terrible experience for the people involved. They also loose the equipment for watching and photographing birds with. The last robbery was around 2 years ago near Pantanos de Villa. Armed robberies are also detrimental to the tourism business as such and very serious events. Luckily, the Peruvian authorities are taken this serious and lots of actions have been taken. We have done a lot of follow up with authorities and police since and we always avoid the sensitive areas. The fact that there has not been any reports of such mishaps since 2 years, is a good sign that the area is safer today. I also started investigated where the stolen goods go. It turns out that there is well known black market in Lima. Next question was: Who buys this stuff? Who is willing to spend 500 dollars on a stolen pair of binoculars that would cost 1500 $ to buy new? When it became clear to me that there are actually guides – natural history guides in Iquitos, Tambopata and Manu – that has need of decent equipment, I knew we had to do something about this. If we could kill the demand on stolen binoculars, then birders would be a less likely target. First step was to let other tour operators know what happened and recommend they’d ask their guides of proof of purchase for their gear. Vortex binoculars and telesccopes are becoming popular among Peruvian Birders. After visiting the Rutland Bird Fair in 2007 making some contacts with Vortex, I realized that there was a small (indeed very small) market to import decent but inexpensive equipment to Peru. Vortex (and their line Eagle Optics) became a natural choice partly because of their good prices but more so their unusually good warranty. The warranty states: In the event that your Vortex product requires service, no matter the cause, Vortex Optics will repair or replace the product at no charge to you. And the warranty is transferable. Votex Fury 6.5x32. My favorite for pelagics. This is particularly good news for the Peruvian birder, who rarely has a insurance for optical equipment to cover for theft. Visiting birders with fancy equipment will be insured and does only have to pay a small deductible to replace their equipment in case of theft or accident. This is not the case for latino americanos, so such inexpensive option as with Vortex with yet great warranty is extremely valuable here. Since last year, I have been importing around 50 binoculars and 7 telescopes. The most popular model is Diamondback. It has 8x and 10×42 models and are priced at 249 resp 259 US$. They are totally water proof and very bright with BAK 4 prisms. On the last order I received what I think shall be for me personally the ultimate pelagic binoculars. The 6.5×32 Vortex Fury on the picture above is extremely bright and has an impressive 3 feet close focus and amazing FOV of 445 ft at 1000 yards. It is a dream to look through with amazing definition. I’ll keep these to myself. Did I mention the price? 329 US$ including tax. Wow! UPDATE Feb 15, 2009: I found a review in the Audubon Magazine online. It confirms my opinion that this is an excellent pair of binoculars. The telescopes are also nice. You get a nice 60mm 20-60x waterproof scope and decent tripod for 520$ The larger 80mm scope with a good sturdy tripod goes for around 720 US$. There is an Extra Defintion glass version of the larger scope for 300$ more and then you are getting close in quality to the big names. And yes, the same warranty for the scopes and they are waterproof. What more can you ask for? I just met with several Peruvian tour operators in Chiclayo for the annual Peru Nature Travel Market – and let everyone know that there is no need for any guide to buy stolen goods, when they can buy Vortex optics totally legally, with tax deductible receipts for businesses, less expensive and with outstanding warranty right here in Peru. The above prices are those available in Peru. 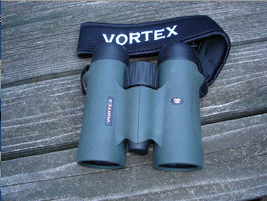 For other countries I can through the dealer prices I get, offer Vortex binoculars at very good prices. Contact me for details. Hopefully opening the market for high quality affordable optical equipment will help stop robberies. People buying stolen goods should think twice, as the products belog really to other passionate birders or nature lovers as they pretend to be. This is a great idea! I like how you’ve found the root of the problem and gone after that rather than trying to treat the symptoms (like trying to secure the birders). I wish you the best of luck in your ventures and hope everything works out! Good to see the market opening up in Peru. After our armed robbery in Pisco which is not a rare event, we were desperate to gear up again with very little luck. We went looking at Polvos Azules only to find the quality low and prices surprisingly high. I didn’t venture down to the other market. I’ve had very good experience with Eagle Optics and wish you well in the endeavor. Hi Richard. When exactly was this and did you do any follow up to higher level i.e. Vice ministry of tourism and/or PromPeru or just the local police? I would be happy to take it to a further level. For those that don’t know: Eagle Optics and Vortex is the same company. I wish to buy a binocular to replace one lost, and am interested in a Vortex Fury 10×32. I am in Lima for a few days from 18th May. Please let me know if you have this (& 8×32 for comparison) in stock & where I find you. Also do you stock Bushnell 8×42? Next post: On American cars. Funny – but quite sad truth as well.